Scott Nicholls (right) in action. There was no joy for Peterborough Panthers in the SGB Championship Riders’ Individual last night (September 2). Number one Scott Nicholls scored six points from his five outings in the event at Sheffield while clubmate Michael Palm Toft managed just five. 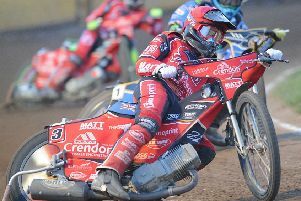 Team boss Carl Johnson said: “Scott dragged himself into contention with three second places after starting with a zero, but he missed the start in his final ride when he needed a win to have any chance of getting through to the semi-final. “He was just slightly off the pace all night and you can’t get away with that in such a competitive meeting featuring so many good riders. “Michael was struggling with clutch issues and he didn’t really get to the bottom of it until after the meeting. Former Peterborough man Craig Cook, who now rides for Glasgow, triumphed in the final from another past Panther, Richard Lawson of Lakeside. Sheffield rider Kyle Howarth took third spot with Edinburgh ace Erik Riss bringing up the rear in the showpiece race.